I learnt a new phrase today – “lexicographic preference” – courtesy of economics professor J. Bradford DeLong. Before I tell you what it means, let me show you what kind of thinking it produces (not on DeLong’s part, but on those he ridicules). I think there’s a good case to be made that taxing people to protect the Earth from an asteroid, while within Congress’s powers, is an illegitimate function of government from a moral perspective. We believe that the decisions of how to deal with the massive asteroid are best left to the individual. DeLong attributes Volokh’s thinking to “lexicographic preference”, which is economics jargon. Imagine you are selecting between alternatives, and you have several criteria to base your decision on. If I understand correctly, choosing lexicographically means applying each criterion in turn (as if you were comparing the letters in two words to place them in dictionary order; hence the name). You stop at the first criterion that distinguishes the alternatives. For such absolutist libertarians as Sasha Volokh, the first criterion is upholding individual rights. If the available courses of action both uphold rights, or both fail to uphold rights, then we can move onto the second criterion (e.g. preservation of human civilisation). However, (a) libertarians in general tend to argue that taxation is theft, and (b) Volokh in particular argues that we do not, strictly speaking, have the right to survive a natural disaster. Thus, the first criterion does distinguish between the alternatives, and so we never need consider any other factors. Thus, government is morally obliged to do nothing to save humanity. Somin’s insanity is… a second-order insanity — the insanity of taking first-order insane claims to be questions about which reasonable people can disagree. In other words, Volokh’s position is demonstrably insane, and those who think that it can form part of a legitimate debate, as opposed to an object of ridicule, are themselves at least mildly insane. Now, having understood the preceding arguments, most thinking people probably have pet topics to which they envisage an application. In my case, lexicographic preference reminds me a lot of the political quagmire associated with unathorised boat arrivals. Politicians and commentators (especially of the Liberal persuasion), cast this as a crisis in which the only acceptable outcome is the total absence of any further “boat people”. There is no consideration for either (a) the humanitarian situation, (b) the diplomatic situation, or (c) the costs involved (or indeed anything else). In evaluating a given policy, the last three factors are irrelevant as long as there is some effect – no matter how small – on the number of boats. A policy that results in x boat arrivals is incontestably superior to one that results in x + 1 arrivals, no matter the cost, diplomatic or humanitarian implications. Unfortunately, this is such a widely-held variety of insanity that any second-order insanity (i.e. that there is a legitimate argument that we should favour fewer boat arrivals no matter the consequences) is redundant. Mr Andrews described the British prime minister’s comments as “fairly sensible” and relevant to Australia. “I think there is a risk [of ethnic enclaves] in Australia,” Mr Andrews said. “What actually concerns me the most is that we can’t have a discussion about it,” he said, as he pushed for a public debate on the issue. Of course, we can have a discussion about the merits of multiculturalism, in much the same way that we can have a discussion about the merits of using tax dollars to stop asteroids from annihilating civilisation. It really just depends on your preferred level of insanity. Senator Back is doing the rounds with a strong anti-boat-arrival theme. I fired back a letter in frustration, which I’ll get to in a moment. the first shows eight arrivals in ’05-’06, while the second shows only one in ’05 and three in ’06. The first pamphlet is (roughly) consistent with official figures. 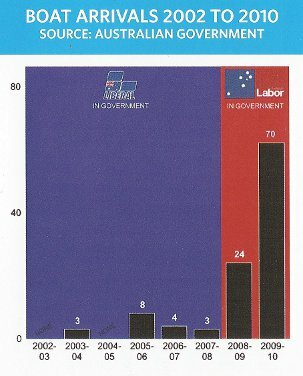 (The figures for Labor are roughly consistent with the pamphlets having been printed a few months apart; they look different, but I can’t spot any definite inconsistencies). I read with great annoyance your second letter and pamphlet regarding boat arrivals and the mining tax. Labor has capitulated on asylum seekers (and climate change). Your party might claim some credit for this, but now that the moral highground is there for the taking, why do you persist in this spurious and degrading line of argument? I am not worried in the least about the number of boat arrivals, and your graphs and numbers mean nothing to me. Frankly, I find the whole issue bizarre and offensive. How does the Liberal Party propose to assist those people fleeing persecution who are clearly unable to come via the official channels? If you do “stop the boats”, surely you will only increase the suffering felt by such people, who are apparently not wanted anywhere. You don’t seem to offer an alternative, other than suggesting that Australia wash its hands of the problem. I would vote for the absence of policy sooner than I would vote for yours. It’s almost as though the two major parties are actively vying to be the more perverse and incompetent. 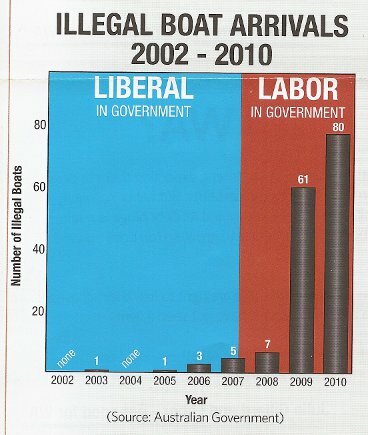 Labor has done everything it can to break our trust, and yet the Liberal Party runs scared of offering anything better. I find it incredible that you’re not able to put together a policy framework to put Labor to shame, because Labor has handed you this opportunity on a silver platter. On the mining tax, very few disinterested experts seem to agree with your point of view. As you know, the mining tax was proposed by Ken Henry in a comprehensive review of the tax system; the Labor Party merely adopted it. Moreover, I’m unsure of the relevance of the figure you quote – the proportion of revenue coming from Western Australia. I’m an Australian before I’m a West Australian, as I hope you are. WA is not a nation in its own right. Australia and all its people own the resources on which the mining tax is to be levied; that much of that mineral wealth happens to be found in WA is neither here nor there. There are many genuine reasons for changing the government. It’s time that the Liberal Party stood up and took notice of them, because as it stands now you do not offer an alternative. Kevin Rudd must secretly love Wilson Tuckey, in the way that one might value a psychopath who happens to inhabit the enemy bunker and can’t actually fire a weapon. In other words, Tuckey plays right into Rudd’s political message. That is a probability, that is what I have been told, so out of 200 Tamil asylum seekers, there could be a Tiger. They are also fleeing the country like any other Tamils because their life is also in danger and I would say their life is in more danger than a common Tamil civilian. The common Tamil civilians are leaving the country because of fear of their lives – these people also will definitely flee the country so they could be in the boat. There you go. Terrorists on boats – case closed. I won’t make too much of Tuckey himself supposedly using this as evidence to support his position. It doesn’t, of course, for reasons that I think are obvious given the above quote. Tuckey previously referred specifically to people coming to Australia with hostile intent, and I doubt that blowing things up in Australia is a terribly appealing strategy for someone fighting for a homeland in the north of Sri Lanka. Tuckey may not have heard the actual quote before he responded, but merely an interpretation of it. If I had more time to dig up useless factoids, I might be able to figure that out. However, I don’t, and so I’m going with my own theory that someone was simply pushing Tuckey’s buttons, which I imagine isn’t a terribly hard thing to do. What is [the asylum seekers’] health status and what threat, unfortunately, might they represent to children and others within Australia. To children, Wilson? Terrorism isn’t enough for you, eh? Now you’re sagely warning us that they might be terrorist paedophiles? The existence of Wilson Tuckey is truly an unnecessary contribution to the heat death of the universe. Quite predictably, he suggests that terrorists are lurking among asylum seekers arriving by boat. If you wanted to get into Australia and you have bad intentions what do you do? You insert yourself in a crowd of 100 for which there is great sympathy for the other 99 and you go on a system where nobody brings their papers, you have no identity you have no address. That’s right! No papers! I mean, how will we know who the terrorists are without the enormous, bright red “TERRORIST” stamp that magically appears in the passport of anyone intending to commit such an act in the future? And these evildoers could gain entry in a matter of months, while being subjected to nothing more than a thorough background check by the immigration authorities, a few headlines in major newspapers and a stint in the Christmas Island detention centre. Not like those terrible long-haul plane trips, where the meals are awful, the seating is cramped and the security is so tight that they x-ray your baggage. This from a man who still inhabits the corridors of power. Greek official heralded for nonchalantly believing paradoxical statements.